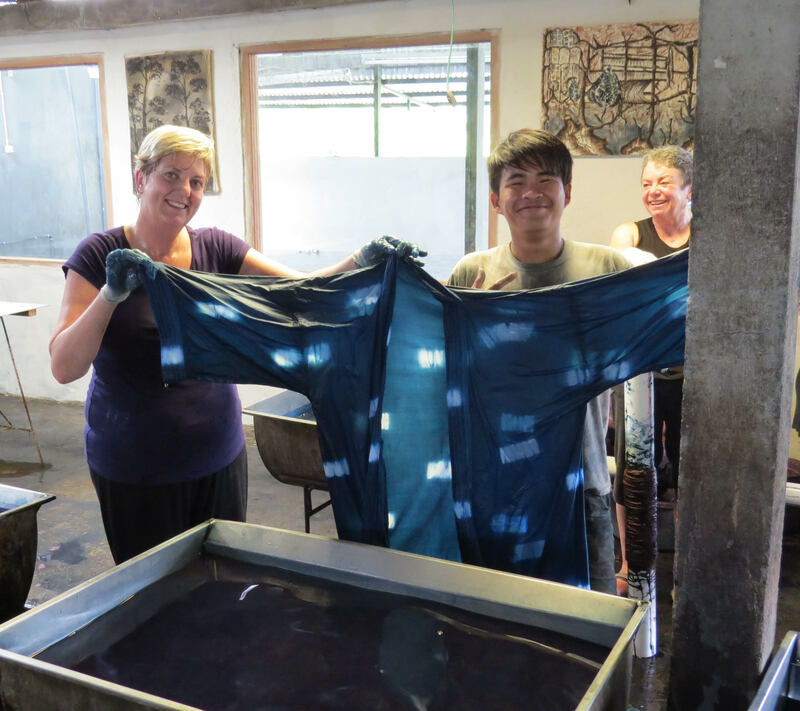 Many countries have used indigo in fabric dyeing including Japan, Taiwan, Central & South America, Thailand, Africa and of course, Indonesia… to name a few. 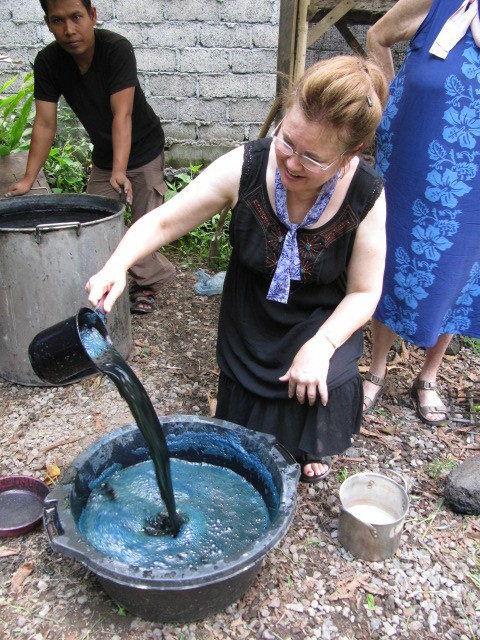 Indigo dyeing from a plant source. Before aerating, the dye is lime green. 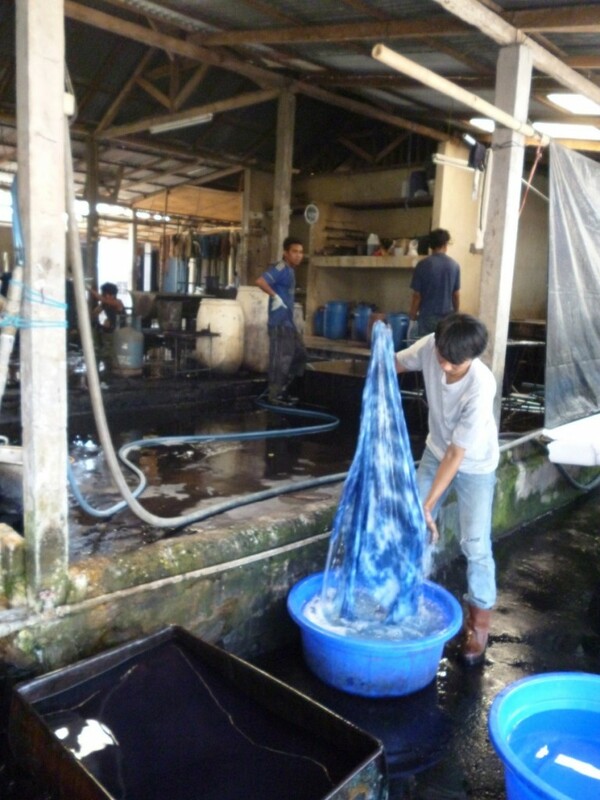 Aerating the vat changes the dye from lime green to deep blue. 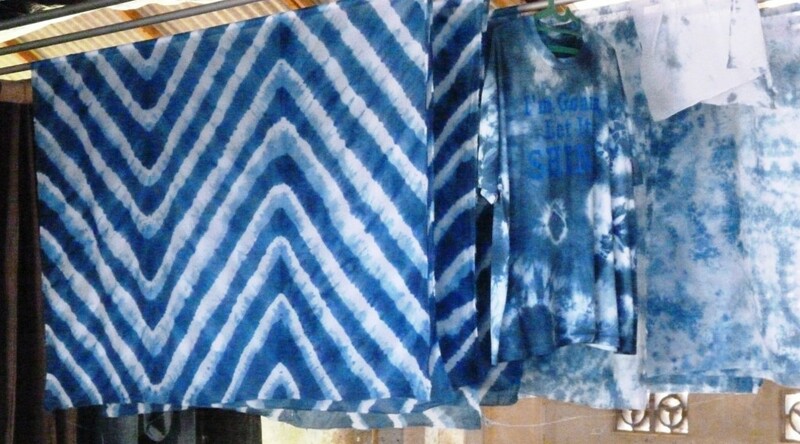 Using a variety of shibori folding and clamping techniques, fabric is prepared for an indigo dye bath and several dips are required to achieve color intensity. 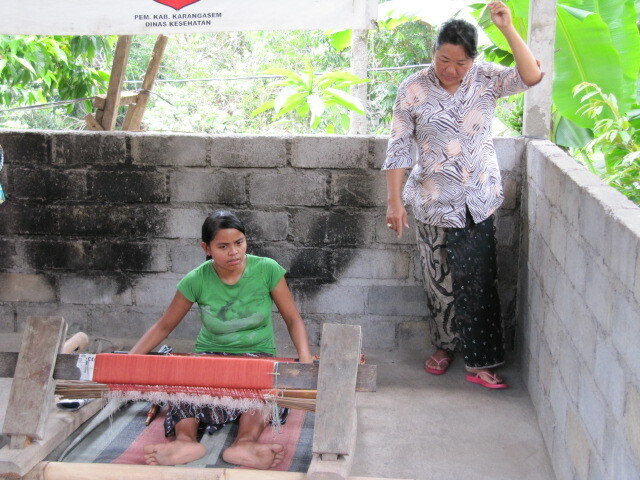 Folding and tying the fabric for dyeing. 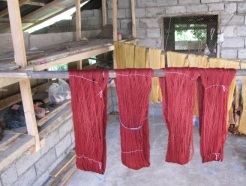 Fabrics are dipped and rinsed repeatedly. 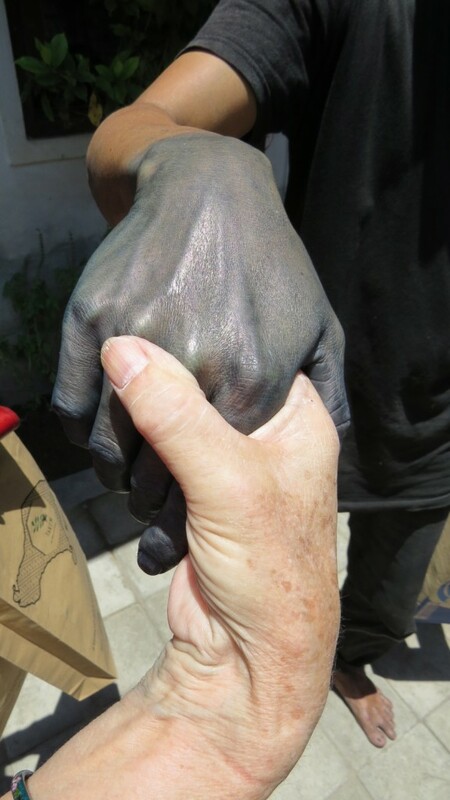 Hands of an indigo dyer. To achieve the very deep indigo blue we’ve come to expect would require dipping dozens of times with the fabric drying in-between. You can see why indigo commands the high price it does. In addition to looking beautiful, indigo fabric repels insects. Blue jeans were initially dyed with indigo, but to keep the price down chemical dyes were later substituted. 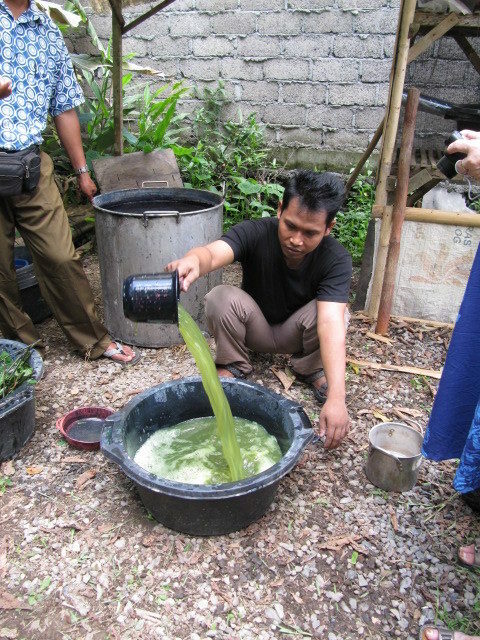 Root scrapings of the morinda tree are soaked, boiled, mashed and squeezed to produce dye. Only ¼ of the root system is unearthed every year so the tree can recover and be used year after year. The root of the Morinda tree produces a natural red (rust) dye. 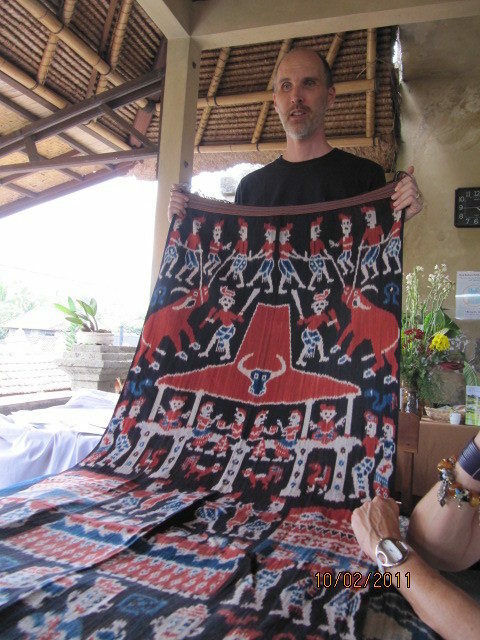 Threads of Life founder demonstrating storytelling ikat. 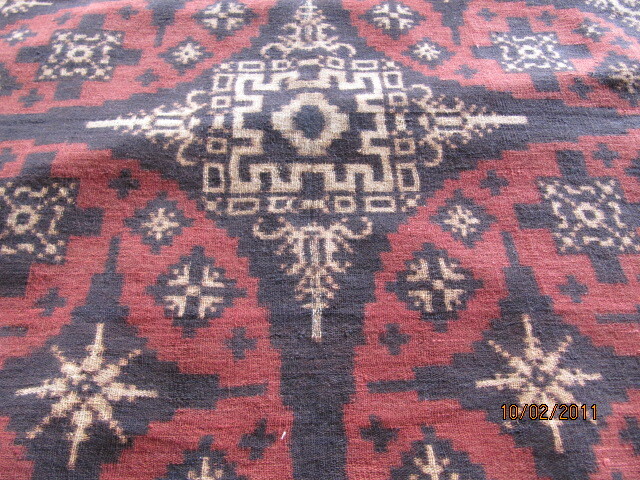 Traditional weavings are often limited in color as this one is. Morinda produces the red/rust color, indigo provides the blue, white is left undyed and the “black” is a combination of indigo and morinda. 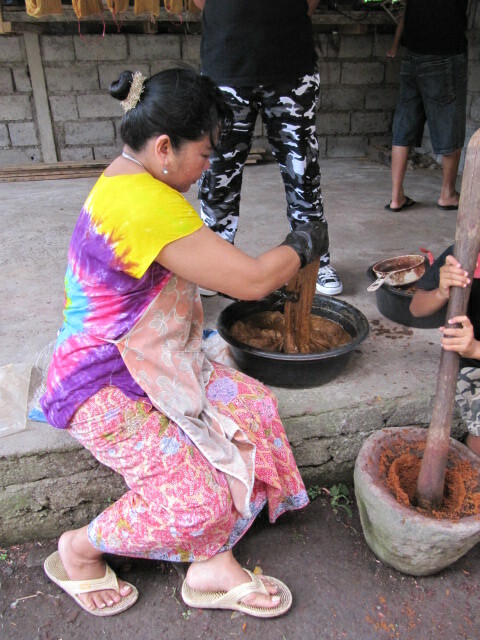 Root scrapings of the morinda tree that will be soaked, boiled, mashed and squeezed to produce dye. 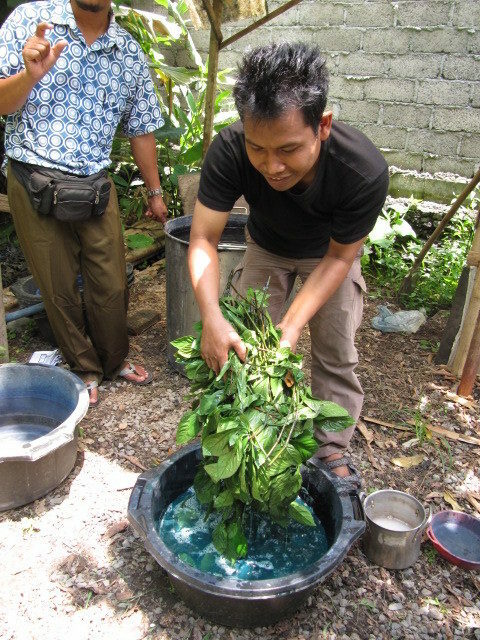 Master dyer Ida Adyu is dipping silk threads in the morinda dye. 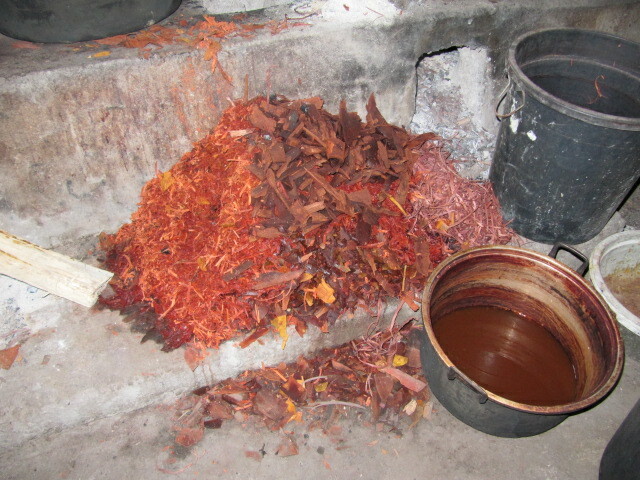 The rust-colored mash on the right is the root scraping of the morinda tree. It will later be wrung by hand into water to form a dye bath. 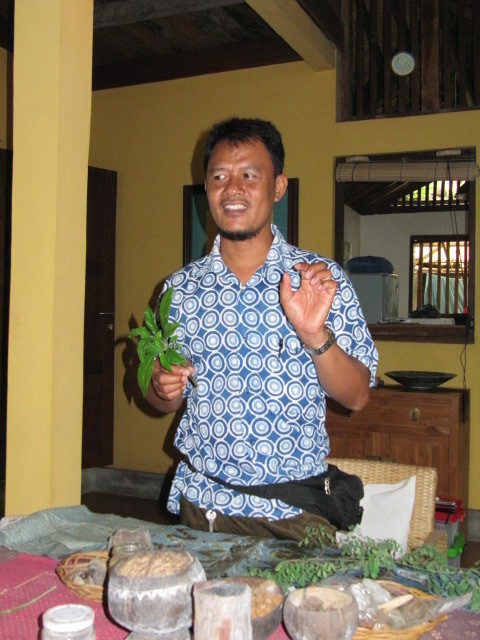 We will visit master dyer/teacher/Balinese textile historian Ida Ayu Ngurah Puniari. Morinda can range in color from gold to deep red. 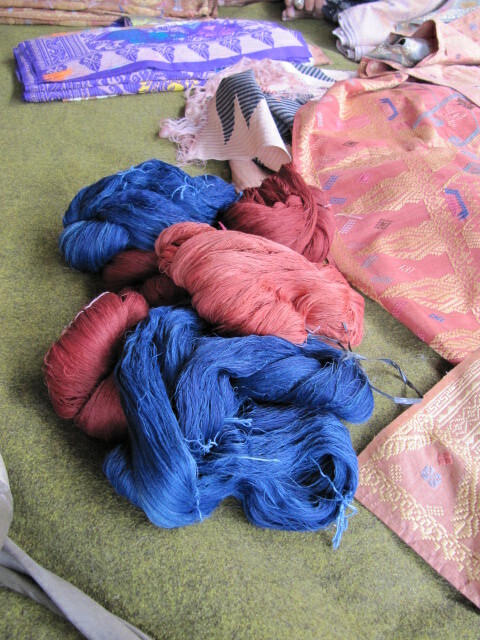 As with indigo, the color intensifies the more the fibers are exposed to the dye. 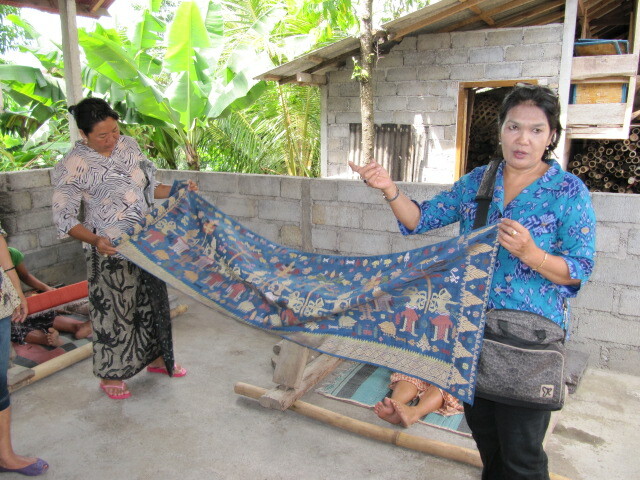 Silk threads dyed with indigo and morinda dyes will be woven into ceremonial cloths similar to the ones in the photograph. 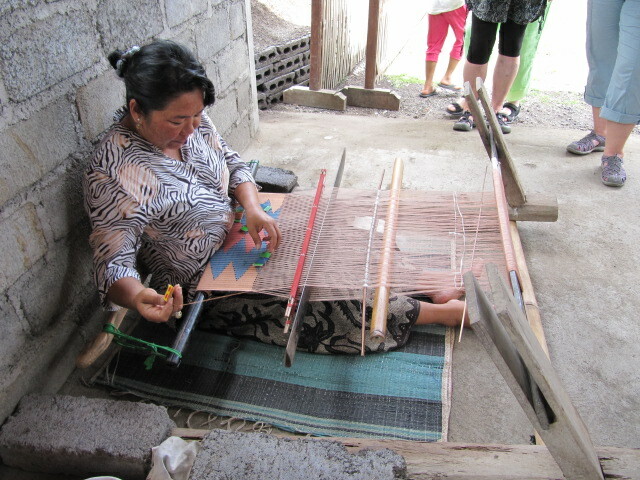 As a teacher, D’Ayu ensures ancient weaving techniques are passed down through the generations. 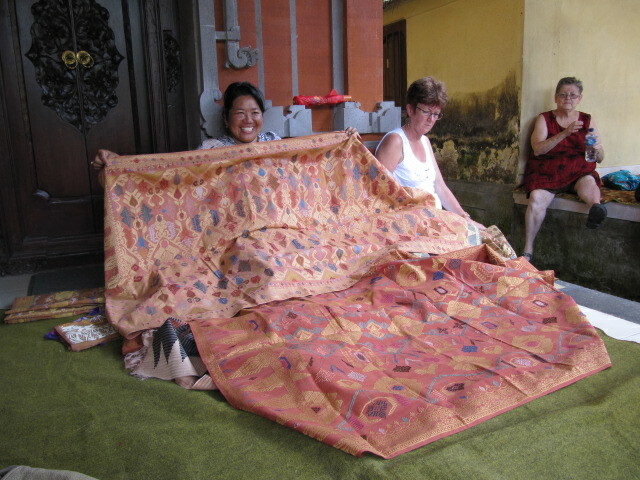 She teaches traditional natural dye and weaving techniques to local women to preserve the culture and to help them contribute to the family income. 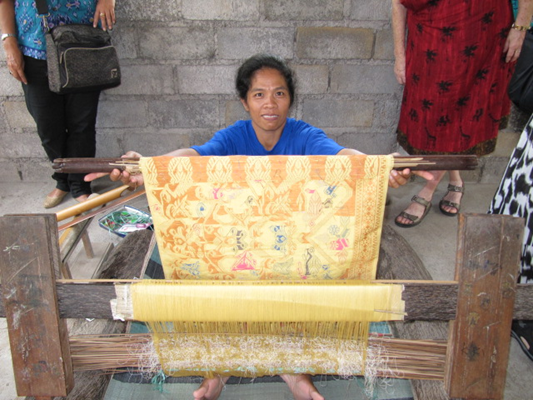 Here D’Ayu demonstrates supplementary weft weaving where the silk threads float above the warp. 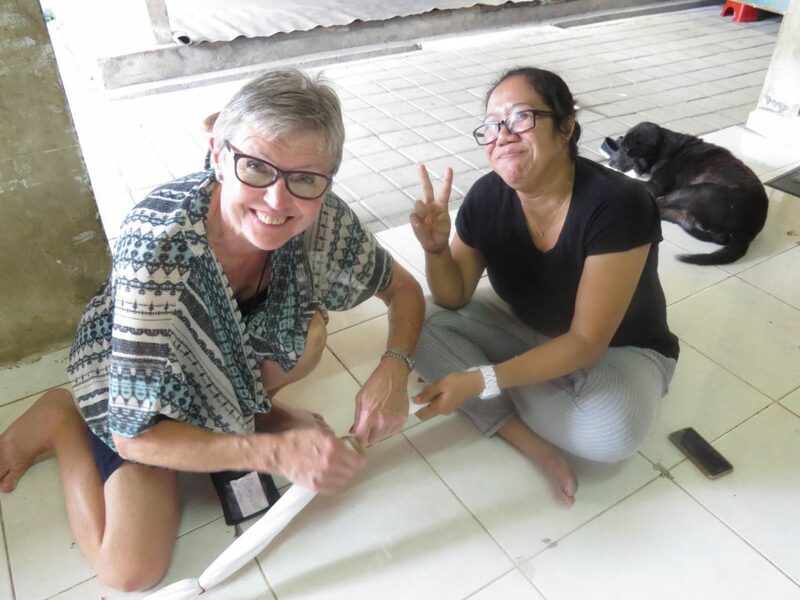 Her students are given backstrap looms like the one shown for them to use in their home. As the daughter of a Balinese high priest, D’Ayu is also the keeper of ceremonial cloths for her ancestry. These weavings tell stories or depict ancestral occurrences or dreams. Silk ceremonial cloths similar to these can be purchased. 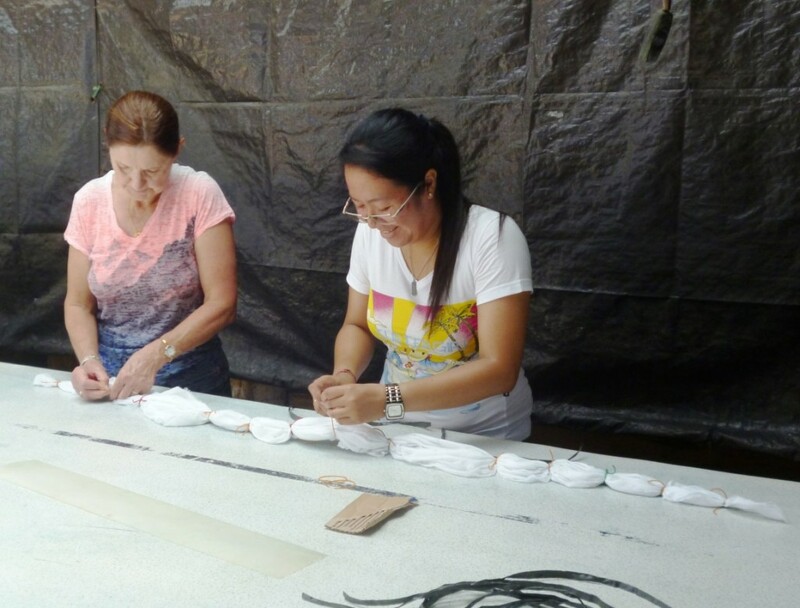 The weavers take great pride in their work and can help support their families with part-time work in the home.